About vCard- vCard is an electronic business card and contains entire contact information such as name, address, email address and etc. It is widely used file format and supported by maximum email client application for sending or receiving contacts from one to other. Why You Might Want to convert PST to vCard ! If you want to send contact information of Outlook to any other email client, then Outlook PST to vCard conversion is one of best way to send your Outlook contacts to any other application. Now you need to convert PST to vCard and for this you need a third-party tool because Outlook does not allows you to convert multiple Outlook contacts information’s to vCard format. 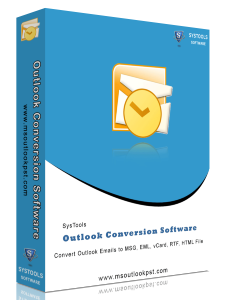 Try the Demo version of Outlook Conversion tool to convert PST to vCard and know about working process of our software. The good thing is that the Demo version is absolutely free of cost. So you can test our software to convert PST to vCard without any penny. To convert PST to vCard, our tool for PST to vCard conversion will be the ideal solution. 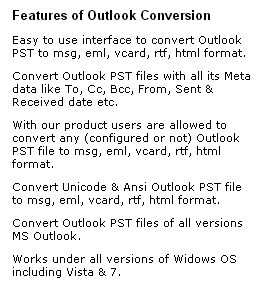 One such software that can convert PST to vCard to PST is Outlook Conversion tool. PST to vCard conversion is very beneficial for you. As you can send your contact information by vCard with great speed and accuracy. vCard is a Internet friendly file format so you can easily send Outlook mails attached with vCard file as contact details. Our PST to vCard converter is advanced utility to convert PST to vCard and allows you to convert configured as well as orphan PST to vCard file format. This tool for converting PST to vCard supports almost versions of MS Outlook and Windows OS also. Further you are satisfied with Demo version of Outlook Conversion tool then you may get the FULL license of our software to convert PST to vCard only at $49 for complete conversion of PST to vCard because Demo version will convert only 15 Outlook contacts to vCard format at a time.